The Greek state granted mining rights for an area of 317,000 acres in Skouries, Northern Halkidi, an area rich in gold, copper and other metals, to the Canadian multinational Eldorado Gold. The inhabitants of the area have been fighting this because it will cause irreversible damage to the environment of this beautiful area – devastating the countryside and with it the tourist trade and dangerously polluting the ground water. There is ongoing resistance and the violent police actions. Thousands of people across the country support the local residents of Skouries by conducting several peaceful protests, like the one in the photo which took place in Thessaloniki. 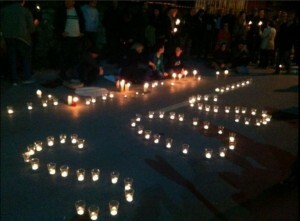 People light candles in order to protest against the mining project and send a message to the government. In February 2015 the new Syriza government started to take measures against the Mining operation in Skouries. ‘By decision DMEVO / A / F.10.1.6 / 172 214/375 / 02.26.2015, the Minister of Productive Reconstruction of Environment and Energy, Panagiotis Lafazanis withdrew No. 14379/3600 / 10.08.2014 Architecture and Electromechanical Design permit which had been issued in August 2014 for the «Skouries Enrichment Unit» in order to re-examine whether the studies submitted, on which the permit was based, is consistent with the relevant planning and environmental regulations.